Rounding out our look at all of the new Subclasses that have been added in with Destiny: The Taken King, today we’ll look at the Hunter’s Nightstalker tree. This one is a little different than what most Hunters are used to with their subclasses. This does give them a Void damage option though, and I think really helps make Hunters much more important in full fireteam play. Before we get to where this class really shows its differences from other Hunter trees, let’s start with the grenade options. As a Nightstalker, you have your choice of either the Spike Grenade, Voidwall Grenade or the Vortex Grenade. The Spike grenade is straight from the Defender Titan tree – it’s very similar to the Lightning grenade, but not quite as effective. Try sticking it on walls and ceilings for best results. The Voidwall grenade is the new one – when you toss one out, it will hit and send a burning wall of Void fire out in both directions horizontal from your grenade. It’s a great zoning option, and does offer a sustained damage choice. The Vortex grenade comes from the Voidwalker Warlock – it’s a good sustained damage choice too, creating a swirling vortex of Void damage. I like the potential for sustained damage on each grenade option here, it’s just a matter of picking the one you like best and are most comfortable. The melee attack though is one of those places where the Nightstalker shows off its differences. Gunslingers have the Throwing Knife – ranged damage. Bladedancers have Blink Strike – extra ranged melee damage. Nightstalkers have Smoke – a thrown pellet of smoke that acts as a slight damage, but a blind debuff. The damage it dishes out is increased should you stick onto an enemy, but that’s really not the focus. Use it as a debuff to blind enemies and help your fireteam – that’s what Smoke is all about. It can be augmented with Envenomed, Vanish in Smoke, and Snare. Envenomed adds a poison damage to the smoke – similar to the Darkness clouds that Hive Wizards spawn. Vanish in Smoke makes any allies near the smoke explosion disappear. Snare lets you put the Smoke pellet on surfaces and has it proximity detonate. I think in general, Vanish in Smoke is the best PvE choice – it’s a great way to get your fireteam out of the danger, quickly. The other two choices are solid all around, but I think shine a bit more in PvP – the smoke already is a slowdown effect, so adding in extra damage is always a good thing; while being able to set traps with it is also a great tactical play. Which brings us to the major change to Hunters’ gameplans – the Shadowshot. You hop up in the air, pull out a Void bow, and launch a shot that tethers enemies. It slows them, anchors weaker enemies and also suppresses and weakens them. It’s a major debuff across the board, hitting pretty much every stat that you want to keep an eye on in PvE. In add waves, it’s awesome for grouping them up for other supers. Against bosses, the slow effect is awesome, the damage buff means Sunbreakers don’t need to close to melee range to apply it, and it can still tether adds too. If that’s not enough, it has three upgrades – Blood Bound, Black Hole, and Quiver. Blood Bound makes it so the enemies you have tethered explode when killed – similar to Bloom on Voidwalkers. It also makes it so damage to tethered enemies is shared – great for tethered majors. Black Hole pretty much is a straight buff to Shadowshot – it gives it more range, longer duration and more tethers. Quiver gives you three shots per Super bar – with reduced Void Anchor range though. Against bigger waves of enemies that are spread out, this isn’t the worst option, but I tend to like the other two more. I see Quiver being the PvP choice, if you decide to go Nightstalker in Crucible. 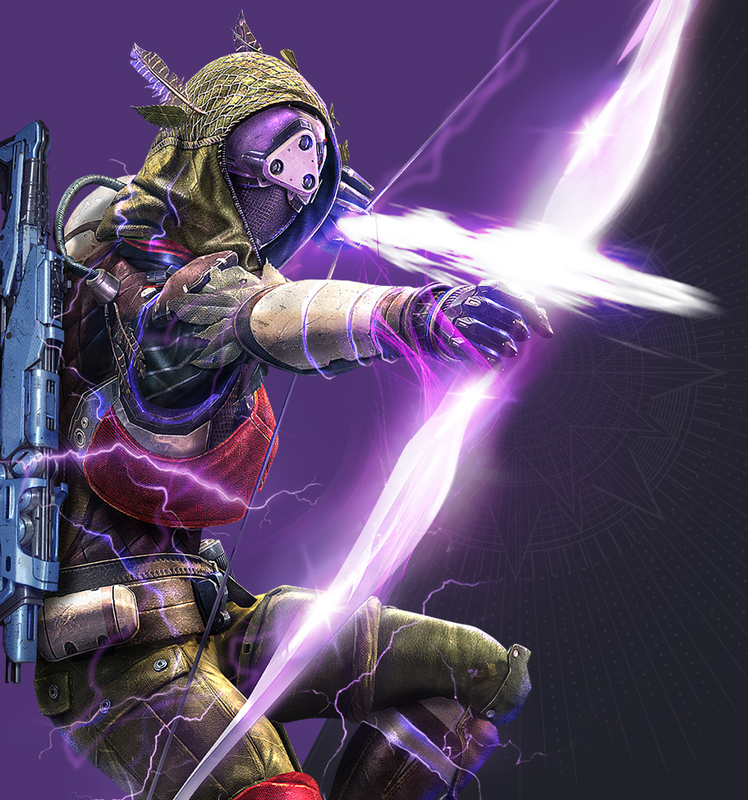 Finally, let’s look at the class specific perks on the Nightstalker. The first column has Courage of the Pack, Light of the Pack, and Lockdown. Courage of the Pack helps out with Shadowshot. Killing tethered enemies gives you increased recovery and armor as well as nearby allies. This stacks up to five times. Both of those are definitely good to have on hand in high level PvE. 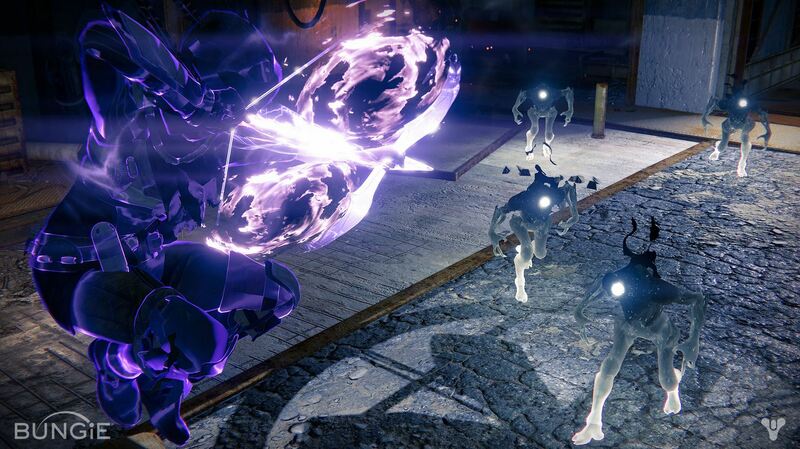 Light of the Pack makes killing tethered targets drop Orbs of Light. Hunters across the board have some Orb generation issues, and this really helps alleviate those issues. Lockdown makes your grenade and smoke effects last twice as long – zoning effects to the max. In PvE, it’s got utility, but in PvP this is definitely a good pick. The second column brings us Keen Scout, Predator, and Shadestep. Keen Scout has you sneaking and sprinting faster, and also gives you the Enhanced Tracker (radar), with the power to also mark targets you shoot. Predator lets you shoot your Void Anchors onto surfaces, turning them into traps – similar to Snare for Smoke. Finally, Shadestep gives you a dive/dodge roll to use. I think here that Keen Scout is a fantastic PvE choice – every part of it is useful across the board. Shadestep though is a great pick for PvP – mobility is always a great thing to have in the Crucible. In general, the Nightstalker gives Hunters a much more important and active role in fireteam play. It’s even more apparent at the high tier level PvE play. Tethering enemies helps control the flow of a fight, the grenade and melee choices just help play into that idea even further. Orb generation is still a little weak, but can be buffed with a perk. It might not be a PvP powerhouse – although I certainly see some situations where Shadowshot could be supremely useful in objective modes. Take the time to really get comfortable with the new abilities and I think you’ll find it to be a fun one.